The air quality in Sacramento continues to be awful, with the heavy smoke in the area caused by fires in Northern California. Consequently, the media attention to this tragic state of events and addressing it in the future continues. My 2016 bill, SB 1463, started with a simple request from within my District from Laguna Beach. It enjoyed a healthy review by committees in both chambers and never received a vote of opposition. But, it was vetoed by Governor Brown. So, we did another SB 1463 this year (using the number again on an intentional basis). Let the record show that I tried to address the global warming concerns with SB 1463. I would conclude that the state’s efforts to truly address greenhouse gases are, at best, a joke, and at worst, a fraud. Not including the greenhouse gases generated by wildfires and not approving the provision of a simple way to address the hardening of electrical power lines is, in my opinion, legislative malpractice by the majority party. A few days of wildfires generate as much in greenhouse gases as all of the cars in California operating for an entire year. [Governor Brown’s] not addressing the real root causes of “climate change” makes him look like a flimflam man. Consequently, I’ll try to help him out in his last year of office by crafting legislation that directs cap and trade tax revenues towards addressing the state’s aging and vulnerable utilities infrastructure and electrical power distribution. With more than 40 casualties, most of them 70 years of age or older who could not flee, this state needs to get serious about reducing wildfires. Blaming climate change is embarrassing and it’s a misdirection of the most disingenuous type. As crews across California battle more than a dozen wildfires—including the largest in state history—the blazes are spewing enough carbon into the air to undo some of the good done by the state’s climate policies. What’s even worse: Climate-warming compounds that will be released by the charred forests long after the fires are extinguished may do more to warm up the planet than the immediate harm from smoky air. Scientists say that only about 15 percent of a forest’s store of carbon is expelled during burns. The remainder is released slowly over the coming years and decades, as trees decay. That second hit of carbon, experts say, contains compounds that do more to accelerate climate change than those from the original fire. And future fires over previously burned ground could make climate prospects even more bleak. It’s a scenario that could explode at any time. Enstice cited a research paper published this year that laid out a chilling tableau: California has more than a 120 million dead trees strewn around its mountain ranges, with the southern Sierra hardest hit. When fires hit those downed trees, the state will begin to experience “mass fires” spewing plumes of carbon. The resulting conflagrations, according to the researcher, will be almost unimaginable. 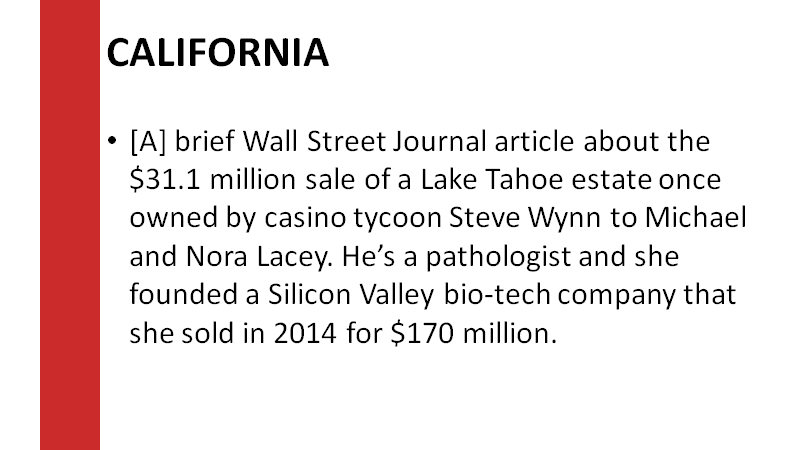 And today’s The Wall Street Journal opines in “Fire and Water in California” (see https://www.wsj.com/articles/fire-and-water-in-california-1533683261). “With climate change, some scientists are saying Southern California is literally burning up, and burning up as maybe a metaphor or a description not just to the fires right here, but what we can expect over the next years and decades,” Brown said.Today, as California burns once again under torrential wildfires, many Californians have been asking why the dramatic increase in wildfires in the last five years… that is everyone except Governor Jerry Brown. Governor Brown claims that year-round, devastating fires are the “new normal” we must accept. Laguna Beach went through four fires sparked by utility lines in the last ten years, and has done as much in the way of prevention as they could afford. The bill would have allowed cities to work with utilities to underground utility lines, and work with the Public Utilities Commission to develop updated fire maps by requiring the PUC to take into consideration areas in which communities are at risk from the consequences of wildfire — not just those areas where certain environmental hazards are present. Authored in 2018, the new Senate Bill 1463, aptly named “Cap and Trees,” would continuously appropriate 25 percent of state cap-and-trade funds to counties to harden the state’s utility infrastructure and better manage wildlands and our overgrown and drought-weakened forests, Moorlach recently wrote in a San Francisco Chronicle op ed. As important, Sen. Moorlach’s second version of SB 1463 would also have required the California Air Resources Board to include greenhouse gas emissions from wildland and forest fires in their updated Scoping Plan. The ARB does not actually track GHGs – they just estimate. The ARB is extorting millions of dollars from California businesses on their best guesses. It is estimated that “for every 2 to 3 days these wildfires burn, GHG emissions are roughly equal to the annual emissions from every car in the entire state of California,” USA Today/Reno Gazette reported in 2017. Last year, there were more than 9,000 major wildfires which burned over 1.2 million acres. Several of the large fires were caused or exacerbated by sparking utility lines. The problem is that the Air Resources Board Scoping Plan ignores the most egregious of all GHG emission problems – manmade wildfires. Instead, the ARB spends a substantial amount of cap and trade funds on high-speed rail, which literally increases GHG emissions and eliminates large carbon sinks. The ARB has a history of diverting funds to pet projects and programs that have little or nothing to do with actually reducing GHG emissions. “Civilization began more than 10,000 years ago and, in my opinion, it hasn’t reached California yet,” Dr. Ball added in a guest opinion at Watts Up With That, an outstanding website dedicated to actual science (no emotions) about global warming and climate change. Yesterday afternoon, my staff had the privilege to meet and listen to Orange County resident Robert Arnott. I’ve known Rob for years through my role as a trustee of the Orange County Employees Retirement System while I served as the Orange County Treasurer-Tax Collector from 1995 to 2006. Mr. Arnott wrote me recently to inform me that he is leaving a beautiful and massive ocean view home overlooking Newport Harbor to relocate to a new home in Miami, Florida. So I asked him to visit with me and share why. He not only shared his personal story, he also shared his good fortune and career history in California, and his concerns about the unfunded pension liabilities facing U.S. citizens in every state. To appreciate the discussion, read his piece, “The Great Tax Migration,” at https://www.realclearpolitics.com/articles/2018/04/24/the_great_tax_migration__136885.html. For background on the justification of his move, see MOORLACH UPDATE — SB 227 — January 15, 2018 . I share this to point out that the Flashreport piece below is not an exaggeration. It is not hyperbole. And, while the good ship California has a massive leak, its Democratic legislators have not been willing to even put a cork into it. 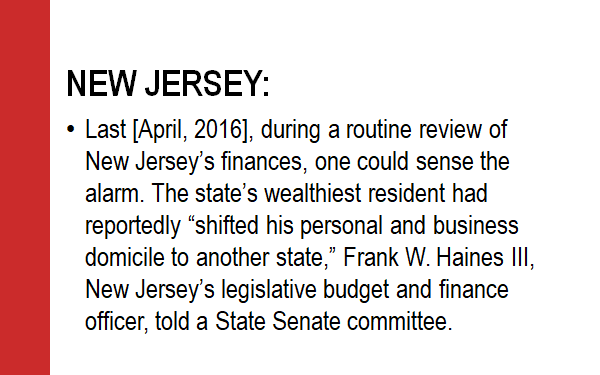 The closest they have come is the embarrassing attempt to make state tax payments deductible as contributions (see the link above). The future of California is not looking as rosy as the state’s Democrat Party politicians want us to believe. Whenever challenged on the stability of his economy, Gov. Jerry Brown’s knee-jerk retort is, “California is the fifth largest economy on the planet,” as if the size of the economy in the most populous state in the nation is relevant. With nearly 40 million people, California now feels and looks like a Banana Republic in the cities, as well as rural areas in the state. 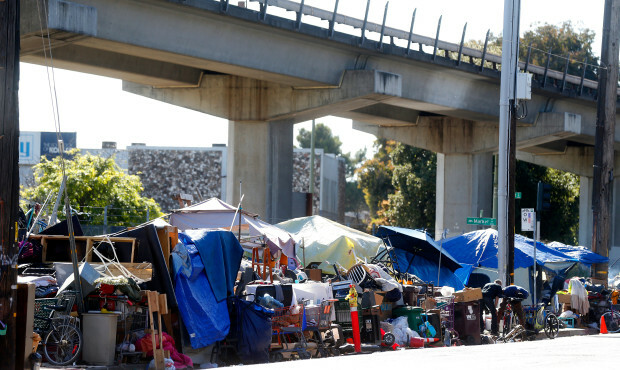 Whether you are forced to check the public defecation map to navigate the streets of San Francisco, are on the 57 freeway in Santa Ana looking at miles of homeless tent cities and camps, or you are dodging heroin-addicted homeless zombies around the State Capitol and on residential streets in Sacramento, the results are the same — Nearly one-third of the nation’s homeless population lives in California. California today is not the California I grew up in. And our Democrat politicians keep telling us to just get used to it. Too many tax-paying Californian earners are leaving California for lower tax, higher-liberty states, willing to forgo the beautiful California weather for more freedom. This does not bode well for California’s future any longer, with the tone deaf Socialist-Communist-Democrats saying we’d all better get used to this. And lest I forget to mention it, this is Jerry Brown’s California where our four-term governor wants to outlaw private ownership of automobiles, supports universal single-payer health care, and issues in-state “visas” for illegal aliens… and constant tax increases are the only way the state and its largest cities seem to operate. 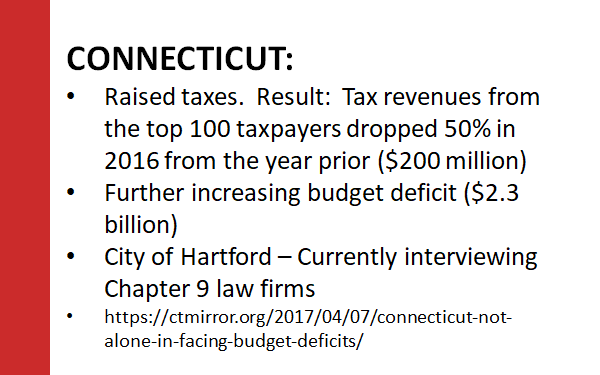 Even while watching the significant outmigration of the middle class, as well as hundreds of millionaires and billionaires, nearly every city has a tax increase on the November ballot. In 2012 when Jerry Brown was getting his Proposition 30 sales and income tax increase on the wealthiest Californians, Sacramento city voters also passed Measure U, a “temporary tax” to allow the City to enact a half-cent sales tax for six years with all revenue going to the City’s General Fund. Proponents claimed the “temporary measure” was needed to stop the loss of city services and jobs blamed on the recession. The City of Sacramento said Measure U was needed to restore and protect City services. “The intent was to restore police and fire services, park maintenance and other essential services that were cut between 2008 and 2013.” The city made it appear unthinkable that voters would deny police, fire and parks their rightful budgets. Most city residents already noticed the loss of city services along with skyrocketing city utility/services bills. But Measure U is set to expire in March 2019. So what does Mayor Darrell Steinberg and the City Council do? They put Measure U back on the ballot for November, to double the size of the tax and make it permanent, saying “inclusive economic growth” makes it necessary. “I’m confident when people see what we can do with a full penny, they will respond favorably,” Steinberg said. If you aren’t familiar with “inclusive economic growth,” you may want to pour a whiskey when you read,”Inclusive growth is economic growth that is distributed fairly across society and creates opportunities for all,” according to many “Sustainable growth” organizations. It’s largely used in third-world countries, so I’m curious why Sacramento Mayor Darrell Steinberg chose this feel-good wording… unless perhaps he agrees that Sacramento is turning into a third world city. In 2017, a city report found a 30 percent spike in homelessness over the past two years, which many in the region felt underestimated the problem. And to our south, L.A.’s homelessness surged 75% in six years . In April, legislative Democrats killed three bipartisan bills that would have made significant changes to the future of California’s pension system. Rather than agreeing to reduce the risk taxpayers face in the $1.2 trillion public pension and health obligations, particularly if we face another recession, Democrats killed the bills, opting to grow the state employee pyramid scheme instead. “Sen. Connie Leyva, D-Chino, countered that she wanted to find ways to encourage more people to join pension programs instead of 401(k) plans,” sacbee.com reported. “I just think we need to do everything we can to get our young people into defined-benefit plans,” she said, proving that their only plan is to bring in more state employees. Republican Sen. John Moorlach’s Senate Bill 1032, which would make it easier for local governments to separate from CalPERS without paying the hefty termination fees that CalPERS charges to fund pension obligations for defunct agencies. If an agency quits CalPERS without paying the fees, CalPERS slashes the pensions it provides to the agency’s former workers. Moorlach’s SB 1031, which would prohibit pension funds from providing cost-of-living adjustments to retirees if the pension fund has less than 80 percent of the assets it would need to pay the benefits it owes. Most retired public employees can receive cost-of-living adjustments of 2 percent each year, but some contracts allow up to 5 percent. Moorlach’s proposal would have applied only to state workers hired after Jan. 1, 2019. Democrat Sen. Steve Glazer’s SB 1149, which would have allowed new state workers to opt for a 401(k) plan instead of a pension. The concept is attractive to younger workers who do not intend to be career civil servants. The University of California is offering a similar plan, and 37 percent of new workers are choosing 401(k) plans instead of pensions. Which came first – the explosion of homeless on California streets, rivers, parkways and highways, or the unfunded pension crisis? Irresponsible politicians created both. There is so much that’s wrong with California, but not so much that it could not be fixed if we could just rid ourselves of the irresponsible, selfish, malignant, unstable Democrats in government – the same Democrats who put labor unions over people, illegal aliens over citizens, and their own power over the well-being of their constituents. Even New York Magazine agrees: Democrats Must Be More Ruthless — When They Have Power – NYMag. For more information about California’s public pension crisis, visit Sen. John Moorlach’s PENSION CRISIS page – the only CPA in the California Legislature tells the unvarnished truth.